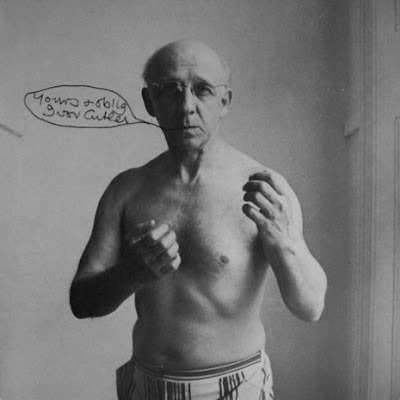 In 2006 we lost one of our country’s Great Eccentrics with the death at 83 years young of poet and performer Ivor Cutler. Born in Glasgow in 1923, we Scots claimed him as one of our own once success came his way with his unique brand of surreal, yet occasionally insightful, whimsy. But in reality, although his unhappy childhood shaped much of his outlook on life and hence his work, it was only once he had scooted off down South that he began to bloom. His was a name occasionally banded about at school by the In-crowd, but I only really began to get to know his work in 1986, after a work colleague suggested we all go along to see the man perform at the Edinburgh Festival that year. As an introduction he brought in his small collection of Ivor Cutler albums: Dandruff, Jammy Smears and Velvet Donkey for us all to take home and listen to. These were, I can safely say, totally unlike anything I had ever previously (or since) encountered: Cutler’s compositions a peculiar mixture of child-like wonder and world-weary melancholia. Much of the stuff was genuinely interesting and amusing and entertaining, but just as much appeared to my ears unfathomable ramblings. But I suppose, that was part of the Man’s charm: not all of his musings would appeal to everyone, but at least some of it should find a home in the heart of everyone. And if one did not like what was going on with a particular track, never mind. It would soon be over with another to follow. This was certainly the case with Side 2 of the Dandruff release, which boasted 30 tracks! These dates at The Assembly Rooms in 1986 were primarily to promote his Gruts album, which I had not heard so I cannot say how much of this particular collection was performed. I do recall our colleague (The Cutler fan) having a seat to the end of a row, and as consequence could see just offstage. His genuine and spontaneous utterance of “There’s Ivor!” rattled around the auditorium just a split second before the applause which greeted the man’s appearance. Although Ivor’s performance was punctuated by a few musings after which one was left wondering “Now, what was all that about?”, it was never less than engrossing entertainment, with the audience hanging on his every word it seemed. There was, unfortunately, a "Laughing at Shakespeare’s Jokes” element in attendance. You know, those sorts of folks who laugh out loud, just a touch too heartily at points where they think they should. Even if they have heard the joke a dozen times before. Cutler recognised this I think, and particularly excitable sections of the audience were requested to “Settle down, now”. I remember the wonderfully surreal Gruts For Tea being aired, plus the silly short I’m Happy, and that is sort of it. Precious little from the three aforementioned albums appeared, with the exception of the Dandruff album track Walking to a Farm, which Cutler performed as an encore, accompanied by his puffing and wheezing pedal harmonium.